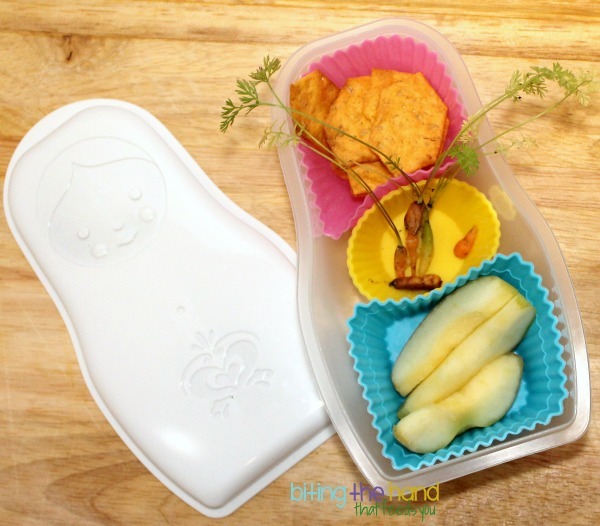 Ever since I got this matryoshka doll bento box for Z (and a red one for E!) I've been dying to use it. But I'm terrible at mapping out where everything will go and then crammer-jammering it compactly and neatly into a bento. So I winged it. Friday, 9/6/13 - Because I wanted to use my new matryoshka fork, I decided to try out a salad in her lunch. She'd eaten one at dinner the night before for the first time, and didn't hate it. Woohoo! I used a silicone grass baran to separate the salad from the chunk of corn on the cob left over from dinner as well. Because it would be so small and I didn't want the box to rattle around in her usual lunch cooler (or the matryoshka lunch tote I bought also *cough*) I packed her lunch and water bottle in a smaller Built BYO lunch sack found on clearance after school started. 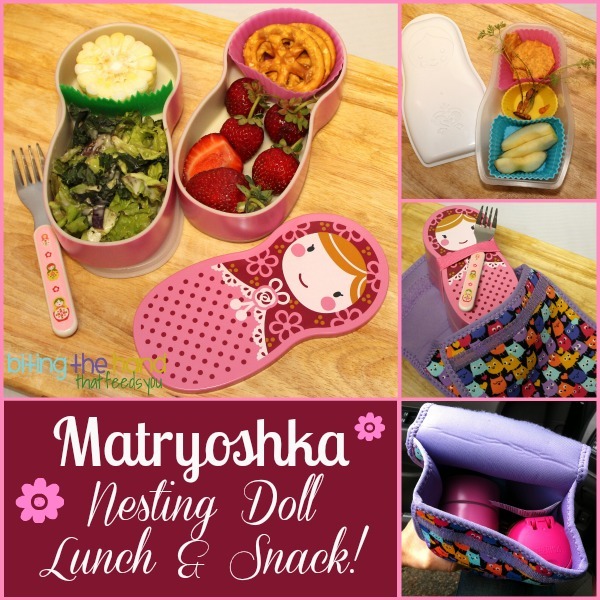 Since I had them, I used one of my Store-Ms nesting snack boxes to keep the matryoshka theme going all day long! This was sent for snack to her AM Kindergarten class. I know those carrots are weird looking, but they're actually very special. My friend "Unka Seesee" was growing rainbow carrots in his container garden just for us! He usually came over every Sunday to watch TV and eat dinner and hang out. But he had just had surgery on his leg, so the girls and I went over to visit him instead, the Sunday before. 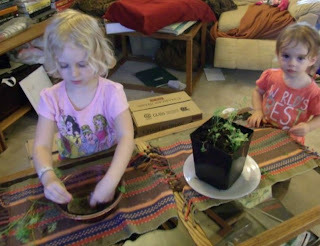 He brought out his planter full of carrot sprouts, and let the girls "harvest" their own. These are the extras that they pulled and washed but didn't eat. I had brought dinner fixin's and cooked and tidied up while he watched Wreck It Ralph and Rise of the Guardians with the girls. 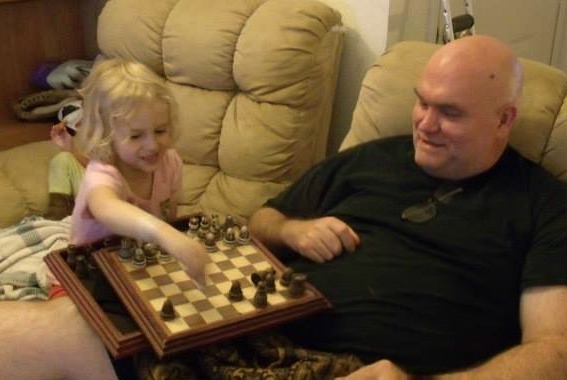 Plus played chess with Z. Which involved a lot of her changing the rules as they went. Due to unforeseen complications, Unka Seesee died one week after this snack was made. I will forever be grateful that we took the time to go visit and he and the girls got to have fun being silly together this one last time. I love that nesting doll box...so cute, Kendra! I'm sure your daughter loved it, too. Hope she ate her salad! I'm very sorry for the loss of your good friend, too.